The new EKT publication presents data on the participation of Greek, 2014-2017, in the Horizon 2020 priority ‘Societal Challenges’. A new publication with data on the participation of Greece, 2014-2017, in the Horizon 2020 priority ‘Societal Challenges’, was recently published by the National Documentation Centre (EKT). The publication is part of its activities in the monitoring of and support for Greek participation from academic, research and business communities in Horizon 2020, the main EU funding framework for Research and Innovation. Analysis of the study data, based on the proposals submitted, approved projects, participations and co-ordinators, takes into account the major successes of participation per challenge, and their distribution in Greek Regions. As the director of EKT, Dr. Evi Sachini observed, ‘Through regular updating of this publication, as well as the corresponding publications for other Horizon 2020 priorities, we aim to provide complete and in-depth updates for all interested parties who want to fully comprehend the performance level of Greek actors in this competitive European financial framework’. The Horizon 2020 programme for the period 2014-2020 has a total budget of 80 billion euros. The ‘Societal Challenges’ priority has been allocated a total of 29.7 billion euro and is one of the three key priorities of Horizon 2020. This particular priority focuses on critical societal challenges for European citizens such as health, sustainable energy, secure societies, inclusive societies, climate change, green transport and food security. Funding for ‘Societal Challenges’ aims to address these issues by combining resources and knowledge across different scientific fields. This particular priority is of great importance both in terms of funding, covering around 37% of the total budget of Horizon 2020, and in terms of the content of funded research, which includes a broad range of research activities. These activities are critical to the well-being and prospects (social, political, economic etc) of Europe, promoting research and technological cutting-edge development in areas with particular social and economic importance. According to available data for ‘January 2014-December 2017’, Greek research groups participated in 5,019 submitted research proposals. The total budget requested by these proposals came to 4.25 billion euros, with 8,291 Greek participations from 2,339 organisations, 1,432 of which were co-ordinators. Of all proposals submitted to ‘Societal Challenges’, Greek participation accounted for 10.1% proposals, 3.7% of total participation and 2% of the total requested EU funding. Similarly, the number of Greek participants involved in these proposals corresponds to 3.1% of all participating organisations, with 2.8% as co-ordinators. The challenge ‘Secure Societies-Protecting freedom and security of Europe and its citizens’ focuses on the development of technology designed to maintain the security of citizens by protecting communities through combatting crime, terrorism, illegal trafficking of humans and drugs etc, while respecting privacy and fundamental rights. Greek research teams were involved in 63 proposals, the equivalent of 25.4% of all approved proposals and 53 organisations had 124 participations in projects, 13 of which as co-ordinators. The approved EU budget is over 42 million euros. In terms of participation and funding, the majority of Greek organisations with successful research proposals for this specific challenge were research institutes, followed by private organisations, universities and other public bodies. Specifically, and in terms of the number of participations and co-ordinators, the Centre for Security Studies is recorded as having the most participations, and is followed by the Centre for Research, Technology-Hellas Certh, which, however, led in the number of projects co-ordinated. In third place, with 6 participations, were the Institute of Communication & Computer Systems, University of Piraeus and the Hellenic Ministry of National Defence. The majority of Greek participants in this specific challenge, and leading by a significant margin, are from Attiki, followed by Kentriki Makedonia, Kriti etc. It is an accepted fact that energy is the driving force of the modern economy, however, maintaining the standard of living in Europe requires huge amounts of energy which comes largely from fossil fuels that accelerate climate change.The EU has set ambitious climate and energy targets to reduce dependence on fossil fuels, introducing the ‘Sustainable Energy’ challenge to develop technology for sustainable energy and reduce dependence on fossil fuels. Greek research groups participated in 125 proposals, 13% of this specific challenge. 102 organisations recorded 208 participations in projects, 28 of which were as co-ordinators. The approved budget for this challenge is in excess of 55 million euros. In terms of participation, the majority of Greek organisations with successful research proposals for this specific challenge were from the private sector, while research institutes achieved the highest concentration of funding. The Centre for Renewable Energy Sources and Saving is credited with the most participations, followed by the Centre for Research, Technology-Hellas Certh, Institute of Communications & Computer Systems, ICCS, HYPERTECH SA and the Hellenic Electricity Distribution Network OperatorSA. The majority of Greek participants in this specific challenge, and leading by a significant margin, are from Attiki, followed by Kentriki Makedonia. A two-fold key objective of the EU is the exploration and implementation of alternative waste management methods, the greater use of renewable resources, the conversion of waste for reuse and sustainable food production etc., including agriculture and forestry, with a view to minimising the environmental impact of human activity. Research in the above areas is considered crucial in creating new standards for more environmentally friendly human activity. Greek research groups participated in 101 proposals, the equivalent to 16% of all approved proposals. There were 159 participations in projects, 13 of which were as co-ordinators, by 81 organisations. The budget for this challenge is just under 40 million euros. In terms of participation and funding, the majority of Greek organisations with successful research proposals for this specific challenge were universities followed by private organisations. More specifically, the most participations in co-ordinating roles were from the Agricultural University of Athens, the Greek Centre for Marine Research and the Aristotle University of Thessaloniki. The majority of Greek participants in this specific challenge, and leading by a significant margin, are from Attiki, followed by Kentriki Makedonia, Kriti etc. Two basic ‘Societal Challenges’ facing European societies: the increased number of people who are near or below the poverty line in Europe, and an alarming increase in youth unemployment, are outcomes of the economic crisis. To combat these challenges, the EU is funding research actions to improve the prospects for social and economic development in Europe. Greek research groups participated in 69 proposals, comprising 25% of all approved proposals. 59 organisations were responsible for 113 participations in projects, 16 of which were as co-ordinators. The budget for this challenge is almost 24 million euros. The majority of Greek organisations with successful research proposals for this specific challenge were universities followed by research centres and private organisations. In terms of funding, the majority were research organisations, followed by universities and private organisations. More specifically, most participations in co-ordinating roles were from the Centre for Research, Technology-Hellas Certh, the National Technical University of Athens, and the Aristotle University of Thessaloniki. The majority of Greek participants in this specific challenge, and leading by a significant margin, are from Attiki, followed by Kentriki Makedonia, Kriti etc. Sustaining biodiversity, protecting ecosystems, promoting the green economy and fostering innovation in environmentally friendly human actions, managing climate change and improving resource efficiency comprise a further ‘Societal Challenge’ for the EU, which is funding targeted research actions under Horizon 2020. Greek research groups participated in 80 proposals, 16% of all approved proposals. 86 organisations are responsible for 154 participations in projects, 13 of which were as co-ordinators. The budget for this challenge exceeds 44 million euros. The majority of Greek organisations with successful research proposals for this specific challenge were private organisations, followed by universities and research centres. In terms of funding, the majority were universities, followed by private organisations and research organisations. More specifically, most participations in co-ordinating roles were from the National Technical University of Athens, followed by the National Observatory of Athens, the Institute of Communications and Computer Systems, ICCS and the Foundation for Research & Technology-Hellas. The majority of Greek participants in this specific challenge, and leading by a significant margin, are from Attiki, followed by Kriti and Kentriki Makedonia, etc. This challenge targets transport systems, in particular their modernisation and development in a way that is sustainable. Covered by the challenge are issues such as the energy security of Europe, traffic congestion, road safety, air pollution etc. Greek research groups participated in 84 proposals, the equivalent of 8% of all approved proposals. 71 organisations participated in 151 projects, 13 of which were as co-ordinators. The budget allocated for this challenge is 44 million euros. The majority of Greek organisations with successful research proposals for this specific challenge were private organisations, while in terms of funding the majority were research centres. More specifically, the Centre for Research, Technology-Hellas Certh had the most participations, followed by the Institute of Communications and Computer Systems, ICCS, which participated in more proposals as co-ordinator, and Patras University. The majority of Greek participants in this specific challenge, and leading by a significant margin, are from Attiki, followed by Kentriki Makedonia, Ditiki Ellada etc. Research into health is a constant ‘Societal Challenge’ for modern societies, and thus, the effort to prevent and treat diseases is critical for all of Europe, as is the need to maintain sustainability of healthcare systems. Greek research groups participated in 73 proposals, the equivalent of 9.4% of all approved proposals. 58 organisations participated in 135 projects, 14 of which were as co-ordinators. The budget allocated for this challenge is 50 million euros. The majority of Greek organisations with successful research proposals in terms of participation and funding for this specific challenge were universities and research organisaations. In terms of participations, the University of Athens was the leading participant, followed by the Centre for Research, Technology-Hellas Certh and the Aristotle University of Thessaloniki, which participated in more proposals as co-ordinator. The majority of Greek participants in this specific challenge, and leading by a significant margin, are from Attiki, followed by Kentriki Makedonia, Ditiki Ellada etc. 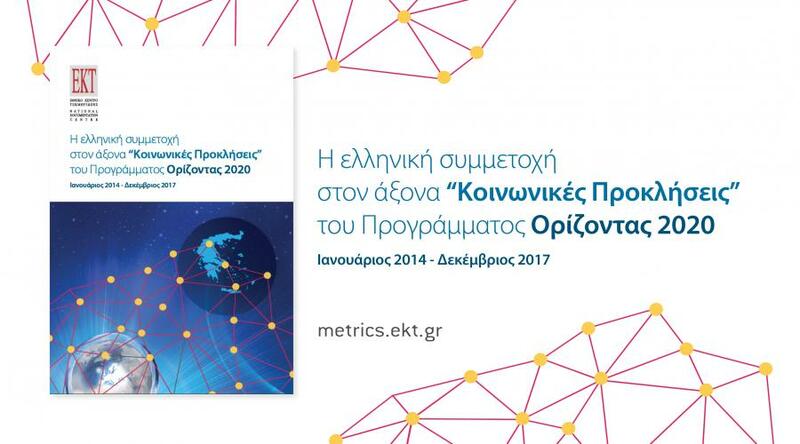 EKT’s full publication on Greek participation (Greek only) is available at http://metrics.ekt.gr/el/node/367. Monitoring and supporting the participation of Greek organisations from academic, research and business communities within the EU financial framework for Research and Innovation, are the key activities for the National Documentation Centre, which is the main National Contact Point for a number of actions and interventions under Horizon 2020. EKT’s special reports and studies, available on its dedicated website (Greek only) (http://metrics.ekt.gr/el/eidikes-ektheseis), provide detailed and in-depth information on Greek participation in the European financial framework, and throw light on important aspects of Greek research activity. Due to the extremely competitive nature of European research calls, the reports are a clear indication of the existing areas of excellence at national, regional and thematic levels.